Build muscle mass with this 7 day mass gain and bulking diet plan. If you want to gain muscle mass and break through your muscle building plateau’s you need a bulking diet plan that will help you to eat more quality food in one day than many people eat in two. Every muscle meal should be packed with diet nutrients to help you gain bigger, stronger muscle mass. 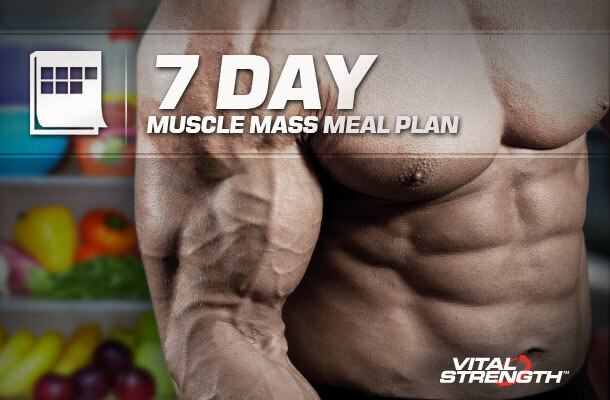 This 7 day high protein mass gain diet and meal plan will help you build muscle size, while giving you all the nutrition and energy needed to train hard and get big muscle mass gains. Muscle Building Meal Plan for your bulking diet. Note: If you don’t have time for lots of muscle meal prep or you can’t cook at lunch, swap the bulking diet plan recipes around or many can be pre-cooked and assembled on the go. This muscle building meal plan should be used as a guide to help you choose the right type of meals you should be eating to grow faster. 2 cups low-fat cottage cheese. 1 cup green vegies. 3 scoops (60g) of Vitalstrength Pro-Muscle mixed with 300ml milk. 2 tbsp shredded coconut, 1 tsp sugar free syrup. 1 sliced banana and berries. 1 large cooked sweet potato, 1 cup green vegies. mixed green vegies or salad, 1 ½ cup cooked brown rice, ½ tin (210g) 4 bean mix. mixed green vegies or salad, 1 ½ cup cooked brown rice, ½ tin (210g) 4 bean mix. Low fat cheese with raw veggie sticks. 1 tsp sugar free syrup. Eating quality high protein muscle meals throughout the day that are packed with muscle building nutrients is the key to getting BIG mass gains. For best results from this mass gain diet plan make sure you drink at least 2 litres of water per day. This muscle building meal plan is designed to be used in conjunction with a muscle mass workout plan and can be adjusted to fit in with your training program.